Illustration of the three stages of diffusional fission gas release. Light-water reactors, which are cheaply and easily cooled with ordinary water, are the largest family of nuclear reactors and account for the majority of facilities around the world. Most reactors of this type use UO2 as fuel, in the form of pellets encased in a zirconium alloy cladding, to generate heat through the fission of U235 atoms. But nearly a third of the fission reaction products are unwanted gases, primarily Xe and Kr, which are transported out of the fuel pellets, form bubbles, and escape through gaps between the fuel and cladding. Gaseous fission products are problematic in a nuclear reactor for a number of reasons, according to nuclear expert Michael Tonks of the University of Florida. He, along with a team of multinational experts from France, Hungary, Canada, and the USA, were brought together by the Nuclear Energy Agency (NEA) to form a task force under the auspices of the Working Party on Multi-scale Modelling of Fuels and Structural Materials for Nuclear Systems (WPMM)* to put together a state-of-the-art report on the fundamental mechanisms of gaseous fission product release. The buildup of gaseous fission products in the UO2 fuel, and the resulting decrease in its ability to conduct heat, decreases the reactor efficiency and increases the centerline temperature, which is a major safety issue. The release of gaseous fission products also degrades the thermal conductivity of the gap, leading to an increase in the fuel center temperature. “The gas bubbles decrease the ability of the fuel to conduct heat and decrease its mechanical strength. They also interconnect and eventually allow the gas to escape the fuel and enter the gap between the fuel and cladding,” explains Tonks. Understanding exactly how the transport and release of gaseous fission products in UO2 fuel pellets occur – how gas atoms are transported through grains, how gas bubbles nucleate and amalgamate at grain faces, and how gases can move through interconnected grain edges to free surfaces where they are released – is vital to ensure LWRs operate safely and efficiently. According to the task force’s report, which set out to identify fission gas behavior mechanisms, determine the parameters critical for modeling, relate these model parameters to physics-based phenomena, assess current data, and recommend new experiments and simulations, a multiscale approach combining state-of-the-art computational techniques and advanced characterization techniques is the most promising approach [Tonks et al., Journal of Nuclear Materials 504 (2018) 300, https://doi.org/10.1016/j.jnucmat.2018.03.016]. The experts from Pennsylvania State University, University of Florida, Purdue University, Los Alamos National Laboratory (LANL), Pacific Northwest National Laboratory (PNNL), Institut de Radioprotection et se sureté Nucléaire IRSN), Commissariat à l’Énergie Atomique et aux Énergie Alternatives (CEA), Départment d’Études des Combustibles (DEN)/Direction de l’Énergie Nucléaire (DEC) at the Centre de Cadarache, the Hungarian Academy of Sciences, CANDESCO, Idaho National Laboratory (INL), and Canadian Nuclear Laboratories (CNL) highlight the advanced techniques that are providing new insights and the critical questions that need to be addressed. As well as new advances in modeling and simulation at atomic- and meso-scales, points out Tonks, there are now new facilities around the world with advanced microscopy and characterization techniques dedicated to studying irradiated fuels. “We have better capability to characterize the fission gas bubble structures than ever before,” he says. But although there is now a consensus on the basic process of fission gas nucleation, growth and migration, transport and release, there are still a number of outstanding issues, such as what defects drive the acceleration of Xe diffusion that leads to the nucleation of fission gases? 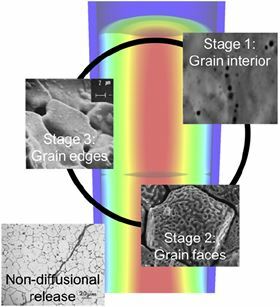 Where do the gas bubbles nucleate – on grain boundaries or in bulk material? How do gas bubbles move from grain faces to edges? Are some grain edges more likely than others to form tunnels for gas bubbles to travel through? Many of these questions are becoming answerable now, says Tonks, and the issues raised by the team could be tackled within a decade with the right resources. As well as improving the safety and efficiency of LWRs around the world, a model of the behavior of fission gas release could prove helpful in understanding other critical behaviors in reactor materials. * The Nuclear Energy Agency’s (https://www.oecd-nea.org/) Working Party on Multi-scale Modelling of Fuels and Structural Materials for Nuclear Systems (WPMM) was established as an international forum for information exchange and discussion on the development of materials for nuclear systems. The WPMM deals with both fundamental science and engineering issues related to the nuclear fuels and structural materials. Its objective is to review, evaluate, and promote multiscale modeling and simulation techniques as validated predictive tools for the design of nuclear materials, fuel fabrication, and performance assessment. It also provides NEA Member Countries with up-to-date information, shared data, models, and expertise. Three Expert Groups operate under the WPMM dealing with different topics: the Expert Group on Structural Materials Modelling, the Expert Group on Multi-scale Modelling of Fuels, and the Expert Group on Multi-scale Modelling Methods. Under the guidance of the Expert Group on Multi-scale Modelling of Fuels, the task force on the 'Unit mechanisms of gaseous fission product release', led by Michael Tonks, recently completed a report, which is laid out in the review article discussed here. Additive manufacturing (AM) technology was reportedly able achieve exception levels of strength and ductility when compared to counterparts.